From the home page of the show’s web site: “Every January something happens that is hard to believe, unless you have seen it! 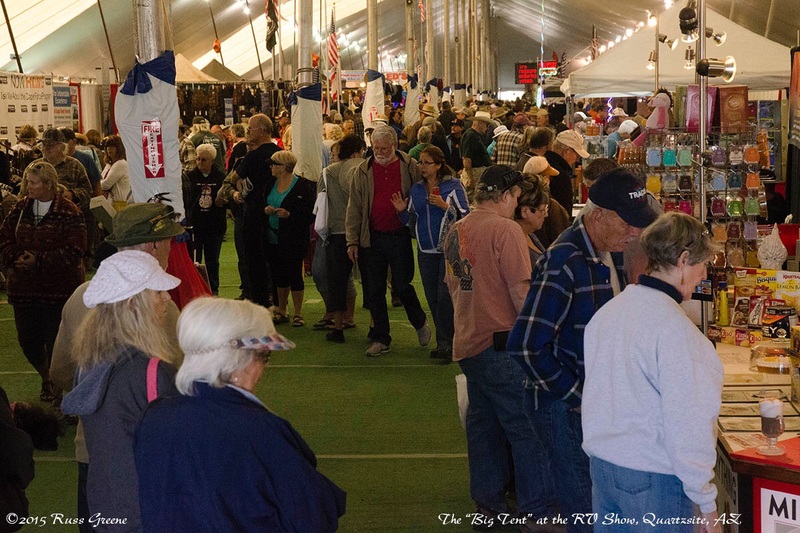 According to the Arizona Highway Department, as many as 750,000 to 1,000,000 people, mostly in RV’s, converge on this sleepy little desert town, located just 20 miles east of the California border on Interstate 10, for the rock, gem and mineral shows, plus numerous flea markets and the Quartzsite Sports, Vacation & RV Show. This phenomenon started over 40 years ago and is now billed as “The Largest Gathering Of RVers in the World”…” I couldn’t have said it better myself. That’s why I quoted the show’s site! Ha! Inside the Big Tent at Quartzsite. I’d guess it’s as least as long as a football field, maybe longer, and almost as wide. If you include the vendors ringing the tent outside then it’s probably wider too. From speaking with others and reading some blogs I had some idea what to expect, but now that I’ve been here a few days those ideas are fleshing out. I’m sure Quartzsite veterans will have things to add to my writings as a first time visitor to “The Spectacle”, my term for it all. I mean, thousands and thousands of RVs encirling this little town out in the desert! What else could you call it? 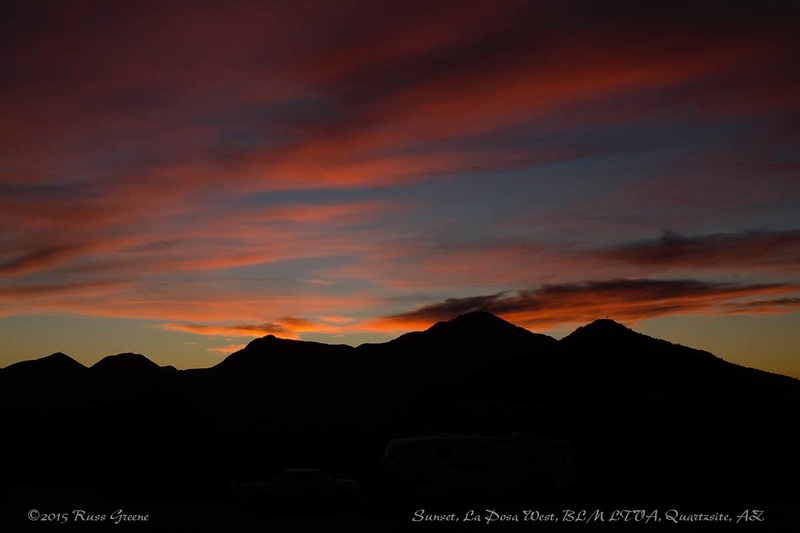 I’d determined that one of the most economical and closest places to the show that I could RV camp would be the BLM’s (Bureau of Land Management) La Posa Long term Visitor Area (LTVA). For $40 you can buy a two week LTVA permit with which you can park in any of the BLM LTVAs if I’m not mistaken, certainly at least those within the Yuma, El Centro and Palm Springs/South Coast districts. I’m not sure if other LTVAs are included or even if there are other LTVAs. My bad. The offices are closed right now so I can’t check. Long Term permits which are good for what the BLM refers to as the “long-term use season” running from September 15 to April 15 are available for $180. Facilities are very limited at the LTVAs. At the very least they include trash disposal. At the most they have that, a phone, dump station, water and restrooms. There are no hookups at any of them which equates to dry camping. Fully-self-contained vehicles, meaning those with a potty and holding tanks are required in some LTVA areas. I’d read on the BLM’s own web site about the La Posa LTVA “The campground entrances are approximately 2 miles south of town.” From what I could determine this would be as close as I could park to the Big Tent without paying much more than $40 for a private campground for the week or so I planned on being in Quartzsite. Since I can easily go for two weeks or more living on my RV’s built in water reserves, holding tank capacities, etc. I figured I’d stay there. Now, I don’t know from where in town the BLM measures the 2 mile distance to La Posa, but I was glad to find that the entrance to La Posa West (there is also La Posa North and La Posa South) is maybe a quarter mile south of the Big Tent on route 95 and once you enter La Posa West you can park as close as maybe 50 yards from the Big Tent if there is room. The entry to La Posa North is directly across 95 from La Posa West and while you may not be able to park quite as close to the Big Tent there it is still pretty close. The spot I found in La Posa West was at most a 10 minute walk to the Big Tent. 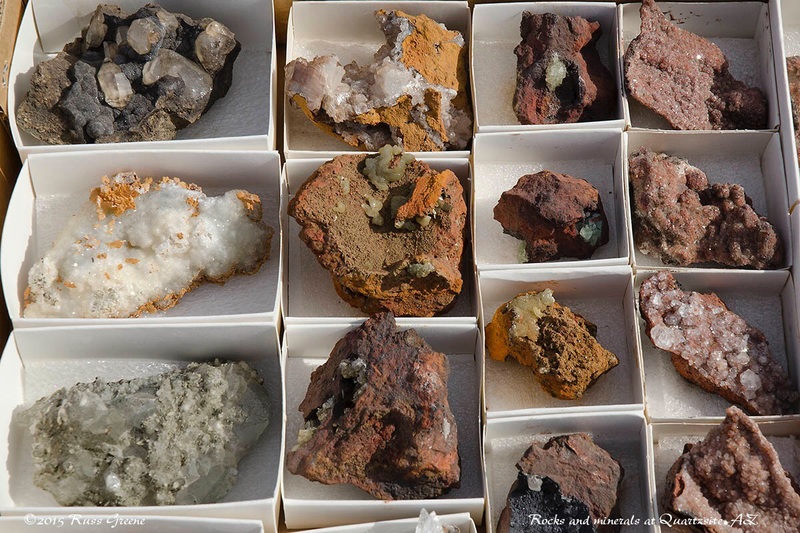 Some of the smaller specimens for sale on one of the rock/gem/mineral dealers near the RV Big Tent. This stuff is so cool. Having paid the fee for a short term permit in the long term area (I just had to say it that way because of the obvious contradiction of terms) at the entry station and setting up camp, I wandered over to the Big Tent passing dozens, maybe hundreds of RVs along the way. 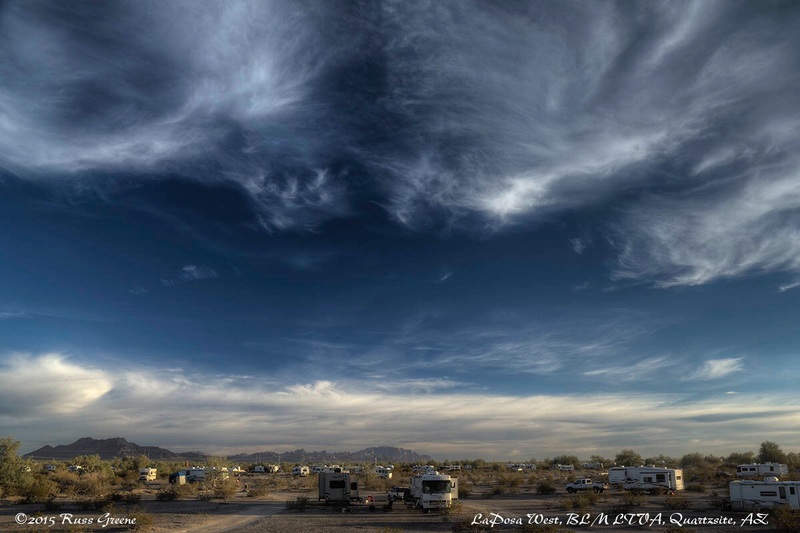 (There were thousands upon thousands of them parked in the greater Quartzsite area I’m sure, at LTVAs as well as other BLM lands where camping is free, and private campgrounds too.) I had come with a list of things I wanted to buy, as well as repairs and modifications I wanted to hire done. So far I’ve met with mixed success. I was able to find an LED replacement for the standard bulb in my range hood, get two tire pressure monitoring sensors replaced, and find another few small items. I still need to get my finicky fridge repaired, want to get my sticking door fixed and a few other things like that. We’ll see in time which happen and which don’t. I have an appointment at a local RV shop for Wednesday so I’ll know more then. Meanwhile, I’ve meandered through the Big Tent a couple times and today wandered around the area outside the Big Tent looking for other locations that might have things I’m looking for or be able to fix things I want fixed. Turns out, besides the RV show, Quartzsite plays host to a number of other events and I learned about some of those on my walkabout. More on that in a moment. While wandering around Quartzsite I stopped into this tent set up streetside. It was full of junk, umm, err, second hand items. I checled the price on some used RV leveling blocks to find I could buy them new elsewhere for about the same price. If you peeked at the link I included above you’d have seen that the show is called The Quartzsite Sports, Vacation & RV Show. I’m uncertain why they chose that name. I didn’t see much in the way of sporting goods. Actually, none I can recall, and I’m not sure what Vacation is supposed to mean in this context. What I did see included quite a few vendors selling LEDs, tire pressure monitoring systems, typical RV supplies and accessories. I saw insurance brokers, roadside assistance program vendors, RV resort and RV club reps, but I also saw a lot of things I’d have not expected at an RV show. These included a number of what I regarded as snake oil pain relieving contraptions and medications. (Many RVer’s are mature in years and with age comes aches and pains.) I saw cosmetics, pet supplies, kitchen gadgets, clothing, cell phone cases. I saw seasoning mixes, frying pans, rifle scopes, and all kinds of other stuff I do not now remember. That was all in the Big Tent. In the area surrounding the Big Tent were other tents and permanent structures. Some of them house permanent businesses while some were set up as temporary showcases. Turns out this area is a big center of trade for rocks, stones and semiprecious gems. I saw quartz, from small pieces you could easily hold in your hand to huge pieces you’d need heavy machinery to move. I saw amethyst geodes and many other kinds to boot. I saw turquoise, malachite and pyrite (fools gold)–all kinds of rocks and minerals from all over the world. There were dozens of places large and small selling this stuff. Oh, and let’s not forget I saw scads of RVs, maybe two scads–old and new, large and small, commonplace and unique. 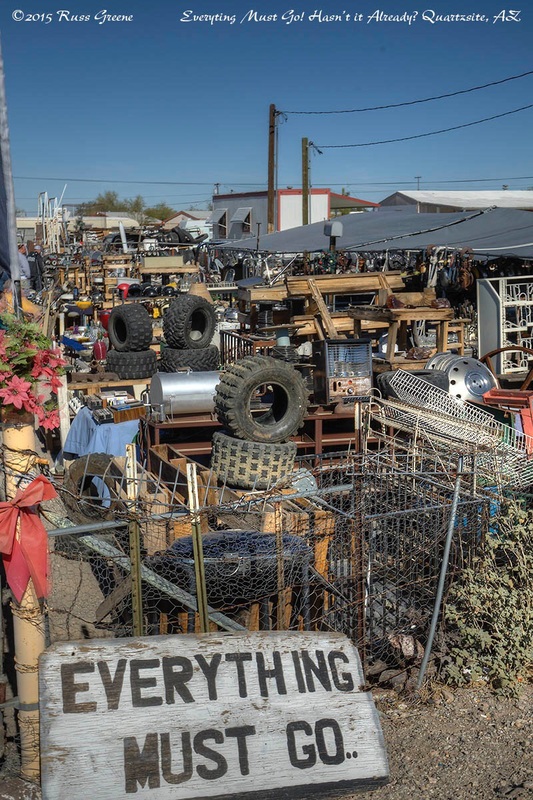 A second hand, flea market style business in Quartzsite. Everything Must Go? Really? I think it already went and that’s how it got here. 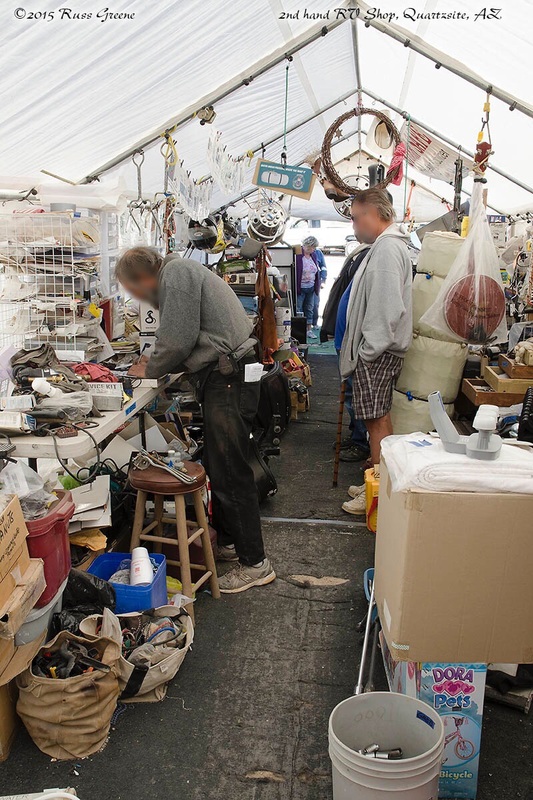 I saw other areas which were really just swap meets like you’d see anywhere else. I found a used RV parts and accessories vendor in a tent which was selling some used things for almost as much as new, maybe more. There were food vendors–kettle corn is big around here, as is Mexican food. The impression I came away with is that Quarzsite is really just a big flea market. This I’m sure is not entirely an accurate characterization. After all, I’ve only been here a few days and during the time I’ve been here the event schedule has included those things which created the ambience in which I found myself, and Ive only seen one section of town. Other events at other times will color the place in other shades. The title of this piece reflects the fact that I’m a newbie when it comes to Quartzsite and it’s for other potential newbies that this piece was primarily written. 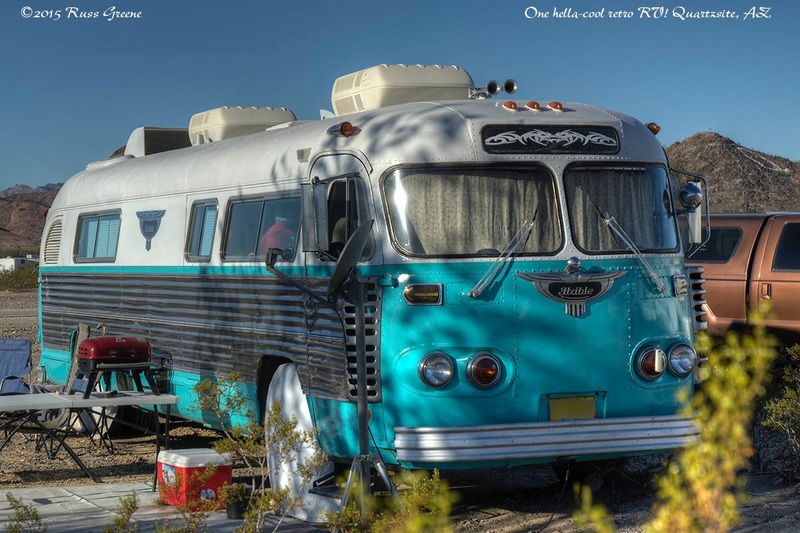 Have you been to Quartzsite? Once? Many times? If so perhaps you’d like to contribute to the discussion. What do you think of the place? Your comments are both welcomed and encouraged. You missed it. Q used to be THE place for deals. The guy to fix your fridge is gone. The Gambler’s was still pretty good the last time we were there and you are right about that “everything must go” sign. It’s been up for many years. Go by to see Paul at the book store. We still have dollars coming for trade in’s there. Go spend some time at Bouse and say hi to folks for us. Many would remember us. Yuma is expensive. Avoid it as much as you can. Turn your fridge off & go for a drive. If you have the ambition take it out and turn it over, a bit at a time, put it back in & it might work. If you want it to work go to RV Cooling Unit Warehouse. (on the web) If Dometic takes care of you, you are living right. Don’t get me started. Also, buy a Dinosaur control board. Hey Bob. Thanks for the tips. Unfortunately, they arrived a bit late. I left Quatrzsite a few weeks ago and am now happily entrenched at the Imperial Dam LTVA. I’ve written several posts about it the first of which is here and also a Boondocking Report. The cooling unit to my fridge was replaced the day before yesterday with a brand new one provided for free as a courtesy by Dometic. I paid for the labor. The warranty and service manager of the company that made my coach went to bat for me and arranged for the new unit. I won’t know for some time if that has fixed the intermittent problem I’ve been having. It’s cooling just fine now, but I’m boondocking on gas and it only malfunctioned one shore power and only now and then. I’m just now publishing a report about my recent solar experiences “It’s 10 o’clock, do you know where your charge controller is?” I’ve included a link to your blog. Thanks again for educating me. Thanks. I’ve posted online at IRV2.com. Not sure I also posted at Good Sam–those posts show on both sites. Nobody has had the answer. I also recently had my RV into a shop and they had no idea what to do. Dometic has agreed to supply a new cooling unit for free even though the fridge is out of warranty. Their best guess is that there is sone sort of pocket in the cooling unit. I think they may have agreed to this becasue nobody can find the problem including their authorized service techs that have looked at the unit. For repairs and sometimes parts, I’ve heard Yuma is much better than Q but can’t speak from experience. I do know one visit for us was enough. Thanks, that’s good to know. I don’t have a lot of hope for getting my fridge fixed here in Quartzsite… maybe not anywhere. There aren’t a lot of shops here in Q. I’ve got an appointment for Weds. at RV LifeStyles and we’ll see what they say. There are a number of other things I’d like done, some of which I think any shop could do, others which may take specialized knowledge. This fridge thing has everybody puzzled. I’ve spoken to quite a few people, from the Coachmen factory service rep, a Dometic authorized repair tech, and several RV repair shops. I’ve looked for ideas on IRV2.com. There have been several theories advanced but as of yet no “Aha” moment. My fridge works fine on propane, and most of the time on shore power, but now and again when on shore power it stops cooling. Switching to gas for a while and then back to AC seems to clear the problem until it happens again, hours, days or weeks later.